Southern Girl Reads . . .
Hello everyone! I wanted to post this update to let everyone know what’s going on lately with Southern Girl Reads. As you can see, if you scroll down, there haven’t been many postings since early last year. Though I kept reading, it became harder and harder for me to maintain the blog the way I wanted. As some of you may be aware, my vision has deteriorated significantly over the last year and it has become impossible for me to see my computer screen any longer. 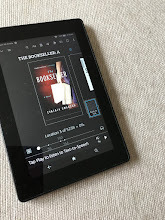 Luckily, with the help of accessibility features on my Kindle and audiobooks I’ve been able to keep reading. I took a break from writing reviews for a while. It was a trying time coming to terms with losing the ability to create my blog the way I wanted to. In fact, I still have my PC stored in my closet! I don’t really know why but just having it there makes me feel better in a way. I guess you could say I haven’t totally let go. With the help of my iPhone and the Blogger app, which I’m using now, I can still post to the blog but i’m still a little clumsy with it. I haven’t fully figured out how to utilize all the tools and manage the layout the way I used to. That’s why a lot of the images and updates have not been done. It drives me crazy! A short time ago I started writing reviews again and posted them on the Facebook page instead because it was much simpler for my eyes. You can easily find Southern Girl Reeds on Facebook via the search box. I invite you to come and like my page to keep up with the books I’m reading and reviewing. I’ll be checking in periodically here on the blog but for now my reviews will be on the Facebook page. I hope you’ll check back from time to time and keep in touch. Feel free to leave a comment, either here, or on the Facebook page. Thanks for stopping by and taking the time to read this post. For the past few years I’ve been making the same New Year’s resolution: to live a more positive life and to avoid negative influences. It’s a great resolution and I had good intentions but each time after several weeks or months I would find myself falling back into old habits, letting negativity back into my life. In the last few years I’ve had a lot of changes in my life, some really good but some very upsetting. As a result it’s become even more imperative that I find a way to bring permanent positivity into my daily life. In the past i’ve dabbled in meditation with little luck mainly because I was not well-versed and just didn’t know what I was doing and eventually stopped the practice. I didn’t feel I was doing it right since I had trouble turning off my brain long enough to meditate. I’d been familiar with Oprah’s show, Super Soul Sunday and had enjoyed watching it a few times. When I discovered Oprah had compiled a few of the interviews from the show and incorporated them into a book I was instantly intrigued, especially with regard to the audio version. I’ll admit that this book came into my life at the exact time I was looking for what it offers and what it offers, among other things, is clarity and knowledge on a subject that can be very daunting. Oprah’s introduction to this book only made me more anxious to get started listening. It was filled with the promise of helping sort out questions I had regarding finding peace in my life. Before listening to this book I was unfamiliar with any of the guests in the interviews. Michael A. Singer, author of the best-selling book The Untethered Soul, is the first person interviewed. I’m not exaggerating when I say that I was totally sucked in. The message in this and the other interviews is not a complicated one on the surface but you need to dig deeper to achieve the peace of mind and calm you are looking for and this book, with advice from these experts in the field show you how to do it. I would say this book is more like an overview, giving you the trolls and references needed for further study. This is a book that I will go back to and listen to again and again for I believe I will hear something new each time. I plan to read several of the books from the guests in these interviews. If you are like me and you are in a place where you are sincerely ready to make a change for mindfulness and a higher level of spirituality, you should definitely consider reading this book. I found it to be a terrific first step towards a more peaceful existence. I absolutely loved the audio version of this book. Oprah narrates the introduction and the beginning of each chapter setting up what will be discussed. Actual audio clips are then inserted so you are listening to actual excerpts from the Super Soul Sunday programs. It’s almost like you’re eavesdropping on a private conversation Oprah is having with each guest. I found it to be intriguing, insightful, and I could’ve listened for many more hours. At only about six hours long, it’s easy to finish in one sitting. You may not agree with everything in this book but if you’re looking for a deeper level of calm and hoping to attain a higher level of spirituality I suggest trying this book. It has inspired me to continue learning how I can Live a more positive life just by changing the way I think. If that’s what you’re looking for I encourage you to listen to this book. This is my first post of 2018 and marks my 10th year of blogging here on Southern Girl Reads. I honestly never expected to be Writing and sharing my love of books for this long but I am thrilled just the same. Although I have to admit, this will more than likely be my last year. As many of you may know I suffer from a Progressive retinal disease that is slowly taking more and more of my vision. I have been able to hang on much longer than I thought. As you will see there will be many changes in the way I post. My reviews will not have as many links or images as normal. These days it is extremely difficult for me to use my regular computer so thanks to modern technology I am using my iPhone to publish my posts. It’s a bit awkward, especially in the beginning, but I’m hoping it will become easier as time goes on. I use the dictate feature on my phone now so I must apologize in advance for any grammatical errors that may occur. I will try my hardest to catch them before posting but I’m sure some will sneak by me. I only ask that you bear with me and excuse my errors. I appreciate so much the loyalty of my readers and of my fellow bloggers who over these last 10 years have become friends for life. Some of you I’ve gone on to become friends on Facebook and other social media and those relationships mean a lot to me. Now that I have all of that over with, let’s get back to the books! For this post I simply wanted to lay out what my goals are for this coming year. It has dawned on me that I have so many books on my Kindle that have been unread and I want to correct that. Though I will be reviewing new releases, I plan to spend a lot of time reading books from my TBR pile that I have had for some time. They may not all be current releases but I promise they will be interesting and, who knows, you may see some books you’ve never heard of before. I hope you will join me in this, my last year of blogging. I still have a lot of books I want to share with you. I’m very excited about the first audio book I’m reading this year. It’s by Oprah Winfree called The Wisdom of Sundays. If you’re not familiar with it, it’s a book about positivity and goodness knows we need all of the positivity we can get in this crazy world. I plan to start listening to it this week but in the meantime I have some other audio reviews to share. Thanks for stopping by on this Sunday and I look forward to posting again soon. I wish you all a happy new year full of wonderful books! When I choose an audio of an autobiography or memoir I always hope it's narrated by the author. Especially in the case of Kevin Hart's book, I CAN'T MAKE THIS UP: Life Lessons. My wish came true and knew I had to make time for this audiobook. The book is longer than some autobiographies but that didn't matter to me because the content was so engaging. Having Kevin narrate his own story gave it such a conversational feel. Like he was speaking directly to me. 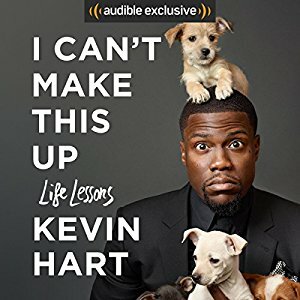 No one knows Kevin Hart better than Kevin Hart and he did a fabulous job of reading his book. Like the title says, Kevin shares life lessons he has learned that helped make him the successful person he is today. He does it in a way that doesn't come across as preachy. He tells the stories of his life growing up with a very strict and religious mother and while he may not have appreciated her efforts at the time, he is smart enough to look back now and realize how valuable those lessons were and shares them with readers. Hart is very candid about his relationship with his father, who was not always there for him and his mom and older brother. It became apparent to me that he has a huge capacity for forgiveness when it comes to his father. Though he can't relate to the drug use that controlled his dad, he accepted that that was who he was at that time and learned not to expect too much from him. He could've easily followed that path but with his sheer will and the guiding, sometimes overwhelming rules his mother set for him, he stayed on the straight and narrow path and never did drugs. What surprised me about the book was how poignant and deep it was espeicially when discussing his parents and later, his kids. You think of Kevin "the funny man" but the vulnerability he showed was so very genuine. I'm not a super fan and I've only seen a few of his movies, but after listening to this audiobook, I am more of a fan than before. I respect his morals and how he doesn't let people influence or compromise what he believes. Though this book is for all fans/readers, I feel like his target audience is for young, black men who haven't quite figured out their own path yet. He is sincere when interpreting the lessons he's learned and hopes to pass on. This book is a gem for that demographic but again, you don't have to be young and black to enjoy it. He doesn't come across as all-knowing or condescending. He's just Kevin. If you enjoy autobiographies, you should add this one to your list, especially in the audiobook format. It's easily on my list of favorites. Charles Martin's LONG WAY GONE is the story of a son and his father living in Colorado. Cooper, or 'Peg', as he's known to people close to him, is the son of a tent preacher who travels to spread the word of God. They live a simple and even prosperous life and as Peg grows older, his musical gifts become very apparent. Peg's father is very protective of him and of the path he wants his son to follow. As a teenager Peg begins to feel oppressed by his father and leaves abruptly to realize his own dreams. He travels to Nashville and soon finds out that dreams don't happen over night. He is totally on his own without the support or guidance of his father. This is a simple yet very moving story of family, loyalty, faith and devotion. Charles Martin is an author I've been wanting to read, but just never got around to it. I picked up a Kindle copy of this book as a Daily Deal not too long ago and figured it was the perfect opportunity. I've been hearing about his eloquent writing for some time. It didn't take long once I started reading to notice his beautiful prose and it just pulled me in. Much of this book reads like a memoir which gives details about the characters and where they've been in their lives, and even the community they live in in Colorado. It's a beautifully written story with a simplicity to it, making it endearing to this reader. It is totally Peg's point of view and you know right away he's a good guy. Since Peg's dad is a preacher, faith plays a big part in this book and I was a little surprised when a figure appeared in the story that was never named but was understood that he represented Jesus. He appears in different forms and it raised the story to another level for me and I liked that it was not over-the-top. The message from this story is that you can always go home, no matter how far you stray, making the title of this book perfect. Peg is a musician, so there's a lot about music and his love for it in the book. Guitars in particular have a starring role. As a lover of music and the guitar, this fed right into my interests and didn't bother me at all. But I can see where too much detail about guitars and their individual sounds could become tedious for some readers and they may skim over those parts. I, myself, am not a skim-reader, so I soaked up all of that information. The bottom line is that I really enjoyed this book and I flew through it rather quickly. Like I mentioned earlier, it was beautifully written and I'm sure the story will stay with me for some time. Charles Martin is an author I will definitely read again and one I will recommend to my fellow readers. Rather than posting a book review today, I thought instead I'd share a little about what's been going on with me personally, not that it's anything earth-shattering. I'll also share what I've been reading lately. In the last few months I've wanted to read a lot, so I've gotten over the lull I'd been in before. But before I get into that, I want to share a few other things first. As some of you may know, I relocated to Columbus from Cincinnati in late March where all my family lives. Since getting settled into a routine here, I find myself so content. More content, actually, than I've been in a long time. Even in Florida, where I spent most of my life. Central Ohio is so beautiful, the weather is terrific in the Spring and Summer but the best part is being able to spend time with my family members and get to know them in a way I was never able to before, living so far away. My cousins who were little when I moved away in 1979 now have kids of their own and I've been spending time with them and it has been wonderful. I'm so thankful for this time. My little cousin, Alyssa, who turns 11 soon, loves to come spend the day and go to the pool. I've loved forming a relationship with her while she's still not too grown up. I love my apartment - it suits me perfectly. It's a loft-like apartment, upstairs with both front and back balconies. The book looks over the back yard of my building with some woods and beyond that lies a golf course.I can't actually see the golf course (except in winter) but I hear the golfers that are probably 50' or so from the treeline. It's so lovely and secluded back there. Everytime my aunt comes over, the first place she goes is to the back balcony 'because it's just so pretty out here'. There's a huge weeping willow tree out there that I love. Many mornings I take my coffee out and read and enjoy the quiet. My mom lives in the next building over around the corner and with my white cane I can go back and forth on my own. (These days there's not many places I can go on my own) On cloudy days I can see much better than when the sun is bright. My friend, Brenda, got me a beautiful sunflower door wreath as a housewarming gift and it really show up against the dark green of my front door, making my apartment easier for me to find on my own. Another thing I'm really excited about is the life style I've adapted since moving here. Back in November of 2016 I had an appointment with a cardiologist for an anuual check-up. Along with finding out for the first time that I was born with my heart on the wrong side of my body, I also was deveasted when I stepped on the scales! I knew I had to make a change. I knew I hadn't felt well, but I thought it was the stress and worry of having to move again, but deep inside I knew I needed to lose weight. My sleep apnea had also returned. I couldn't make it through one night without waking up a few times choking and gasping for air. I've had that enough to know that if I lose weight I don't suffer from that dreadful condition. So in March, as soon as a got settled here in Columbus, I drastically changed what I was eating. And I love it. I've lost 15.4 pounds and I haven't starved myself and I feel SO much better. Sleep Apnea is gone, I don't feel sluggish and run down anymore and people are noticing the change. I'm about half-way to my overall goal and I'm feeling very good about it. I've tried Weight Watchers in the past with some success, but I've realized that particular method doesn't work for rme. Instead, I've changed how and what I eat and it's not a temporary fix. I cut sugar and pasta/potatoes out of my diet all together. I also switched to almond milk about two years ago. I've always had issues with some dairy products. I still have an occasional soft-boiled egg, Greek yogurt and Swiss cheese, but that is about all the dairy I have. I eat a high protein, low carb diet and that works best for me. I'm not starving myself, in fact, I eat every two to three hours, including snacking on protein bars or hummus. I also drink a ton of water and eat a lot of fruit. I've added Matcha green tea powder to my diet as well. I did some research on it and was amazed at the health benefits. There are too many to name here, but the most important for me is the antioxidant benefit in supporting the red blood cells that feed my retinas. That is the main problem for me with RP, so if it can prolong my sight by destroying toxins in my blood, I'm all in. I already consume a large amount of antioxidants but Matcha is the super power of them all. I put a teaspoon of Matcha in my green smoothies and my Greek yogurt smoothies. On those days, Since adding Matcha to my breakfast smoothies, I've cut back considerably on my coffee intake. The caffeine you get from Matcha is much different than coffee. That said, I still love my coffee! I don't eat hardly any red meat, which is really nothing new for me. I eat mainly salmon, fish, chicken, beans, chickpeas and lots of veggies. For me, this way of eating is something I can live with for the rest of my life and I don't have to count points. For the most part I'm really strict with myself, but I do allow a few glasses of wine or a cocktail on the weekends. I'm not losing weight fast, but I'm losing it in a way that works for me and will stay off in the long term. I'm super motivated and every time I step on the scale it motivates me even more. That turned out to be a longer topic than I planned, so please forgive me. I'm just so happy I've found my collarbone again and I'm back to only one chin! Ha! Now, on the the books. My computer has been acting up and not allowing me to upload photos lately, so I won't be able to add any book images of covers in this post. I've really had the readig bug lately so I've got about four books going. Two on Kindle and 2 audios. I'm finally reading an author I've heard so much about but never read any of his work. 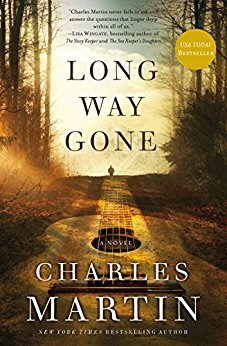 I'm halfway through LONG WAY GONE by Charles Martin. the book came out last year and so far I'm really ejoying it. I like his writing style and I'm totally hooked on the story. It takes place in Colorado mainly, a state I don't really know much about, and he is providing some very interesting facts along the way. I'm also continuing the Louise Penny mystery series, Three Pines, also called The Chief Inspector Armond Gamache Series. I'm on book six right now and though I'm only a third of the way, I can tell it's going to be one of my favorites so far. It's called BURY YOUR DEAD. Penny is such an intellectual writer, in my opinion and I really love that about her. I'm currently listening to an autobiograchy of Eric Clapton called CLAPTON. It's not a new release, in fact, it's about 10 years old, but as a life-long fan on his music, I'm learning a lot about him. Unfortunately, he does not narrate the book, which I wasn't surprised. He doesn't seem to me to be the type to do that. Simon Vance is the carrator, and, as you probably know, he is fantastic. That is what sold me on the audio version. I'm also just starting A MAN CALLED OVE by Frekrik Backman. Another author I'm looking forward to trying soon is Ruth Ware. THE LYING GAME is getting rave reviews and I'm new to her as well. Also, I picked up ROUND HOUSE as a Kindle Daily Deal a few weeks ago and I'm anxious to get started with it. It is so mice to be excited about reading again. I can't help but think that my health or lack of good health had something to do with my slump in reading this last year. Now that I'm back on track with my health, the urge to read is bounding! I apologize for the length of this post. I rarely get so personal here on the blog but I felt compelled to share and I hope it wasn't too much for you readers. Thanks so much for visiting and do stop by again! Happy Sunday! The first stop in our series catch-up is the town of Painters Mill, Ohio, where both Amish and English citizens reside, and where Kate Burkholder is the Police Chief. HER LAST BREATH is the fifth book in this series of nine, currently. What makes this series interesting is that Kate grew up Amish with her family until the age of fourteen, when after being raped by an Amish man, she couldn't continue to live the Amish lifestyle and pretend nothing had happened to her. so she made the decision to leave the Amish way of life. As a result, she is now shunned by her former family and friends. But when there's a crime, Kate does whatever it takes to bring the perpetrators to justice, no matter what. In this installment, Kate is investigating the gruesome collision between an Amish buggy carrying a father and three children and a 4 x 4 truck. The driver of the truck did not stop and three of the Amish died at the scene. The case hits home because the mother in this family was Kate's best friend growing up, though she hasn't seen her in years and now she has to go tell her that her husband and two children are dead. My Thoughts: This book was a departure from the others in the series, because it didn't involve a serial killer but someone who used to be close to her. I enjoyed the personal aspect involving Kate's childhood and liked glimpsing back into that time. While Kate is investigating this crash, remains have been found in the next county over. Kate knows exactly whose remains they are because she put them there. This multi-plot story is one of my favorites of the series and the reader learns more about Kate from each of the investigations. 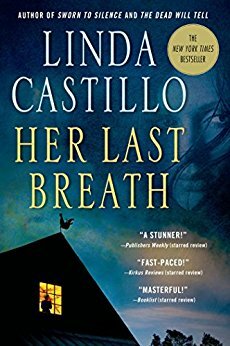 Linda Castillo is a great mystery writer who reminds me a bit of Karin Slaughter, who I really enjoy. Castillo writes with grit and leaves you clinging to the edge of your seat. I'm planning to read the sixth book very soon. THE BRUTEL TELLING by Louise Penny is the 5th book in the Chief Inspector Armand Gamache Series. There are currently 13 books in this series that takes place in the fictitious village of Three Pines, outside of Montreal. Over the last few years, the chief inspector has come to this quaint village while investigators deaths and he has forged friendships with some of the residents. When a stranger's body is discovered in the village bistro belonging to Gamache's friend, Olivier, he is forced to separate his friendship from his job and find out the truth, even if it costs him personal relationships he values. My Thoughts: I absolutely love this series! 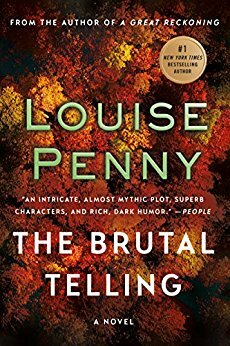 Louise Penny has a different kind of writing style than most mystery writers. I've said before that this is not an edge-of-your-seat series. It's not fast-paced or even all that suspenseful. It's more of a thinkers mystery. She delves into the minds of the villagers and sometimes it's what they don't say more than what they do say that reveals the answers. Penny's love of food and art also comes out in these books through the characters. This turned out to be one of my favorites in the series, leaving me anxious to find out what's next for these somewhat odd villagers and the inspector they've grown to appreciate. By the way, a few weeks back CBS Sunday Morning did a piece on Louise Penny that was terrific. If you can, I recommend pulling it up - it's worth watching. I hope you enjoyed my brief comments on these three books and I encourage you to check them out. I believe they are three of the best ones out there! 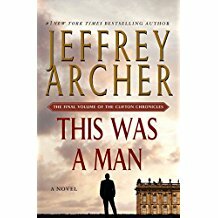 THIS WAS A MAN by Jeffrey Archer is the 7th and final installment of the Clifton Chronicles Series taking place in the United Kingdom. This family drama started back in the 1920's when Harry Clifton and Giles Barrington met at primary school in Bristol. Harry is the son of a poor, single mother and a dock worker while Giles came from the prestigious Barrington shipping family. In this last book, which covers 1980 through 1992, where the story has its final ending. This edition, no different than the others, has it all: business, family drama, politics, and even murder. Jeffrey Archer is a great storyteller who can go from frightening suspense to laugh out loud hilarity seamlessly. As Harry and Emma Clifton and Giles Barrington grow older, they watch as their offspring are making their own ways in the world, following the examples all three have set forth. Old rivalries find closure as the new modern world takes over. Harry, a successful mystery writer finally fulfills the dream his mother had for him and Emma reaches the pinnacle of her political and humanitarian ambitions. My Thoughts; This was the perfect ending to a wonderful series that I am so grateful to have read. I can honestly admit that if I hadn't won the first book (audio CD) from Anna, a fellow blogger, I probably would have never read these books. I was totally unfamiliar with Jeffrey Archer. But that fist sudiobook was such a joy to listen to that I was hooked from the get-go. With only 7 books in the series, it wouldn't be an overwhelming task to start reading it now. For me, it was time well spent and a totally entertaining experience. Archer incorporated certain historical events into the story as well, so that gave it an realistic feel. Though I'm sorry to have this series come to an end, it was done gracefully with a wholly satisfying finale. Scobberlotch (v.) to loaf around, doing nothing in particular.